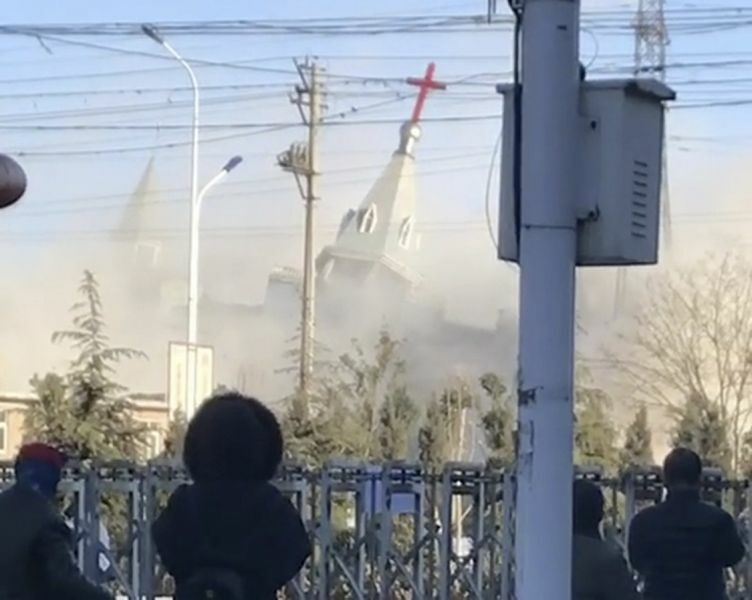 Chinese authorities have detonated bombs to bring down a Christian Church in Linfen, China on Tuesday marking a turning point in the ‘Religious Winter’ against Christianity in the Communist Nation. According to ChinaAid, an organization that monitors Christian persecution in the Atheist country, the destroyed Golden Lampstand Church is “serially persecuted” and stated that the unregistered church was privately paid for by its members for just over $2.6 million. The organization further speculated that orders to destroy the Church came from top Chinese Officials because military police are currently under government command. The detonation is not the first time that the Golden Lampstand Church has been effected by Communist persecution, instead, ChinAid reported that several of the Churches officials have been jailed for simply serving the Congregation. 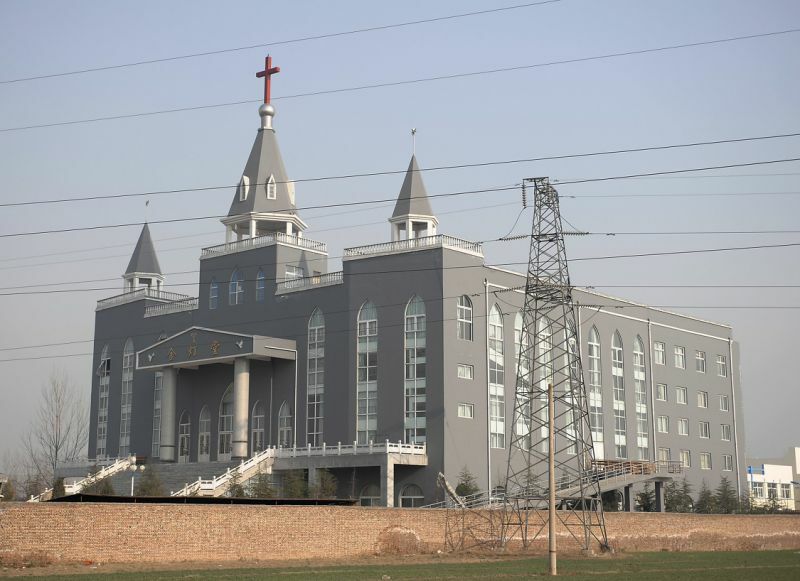 ChinaAid President Bob Fu also recently stated that the destruction of this Church, and the persecution that the congregation has faced further prove China has “no respect for religious freedom or human rights” and he called on the world to take action. 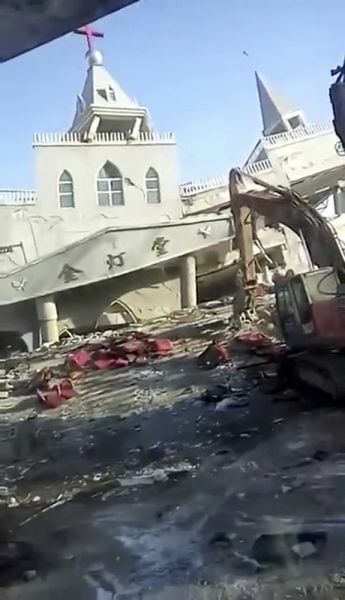 Scores of police and local officials demolished a large church in the Shanxi Province city of Linfen on Tuesday, thwarting efforts by congregants to halt the demolition and pressuring them to remain silent, witnesses told RFA’s Cantonese Service. The Golden Lampstand Church was surrounded by officials, while cranes and bulldozers methodically reduced the large building to rubble, according to a witness who spoke to RFA. “It has now been demolished,” a church member told RF by telephone. Asked if congregants were being beaten by police, the witness said they had not, quickly adding “I’m under house arrest now” before hanging up. Efforts by RFA to reach the church member by telephone received no reply. Calls to the Linfen City government also went unanswered. Ren Quanniu, a lawyer who frequently works on religious repression cases, told RFA that churches have often been demolished in China without means for members to seek legal redress. 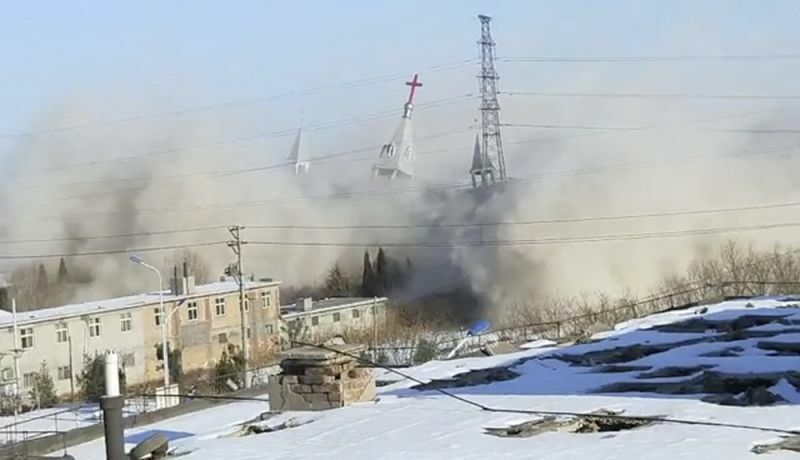 A church in northern China was demolished this week, the second in less than a month, sparking fears of a wider campaign against Christians as authorities prepare to enforce new laws on religion. 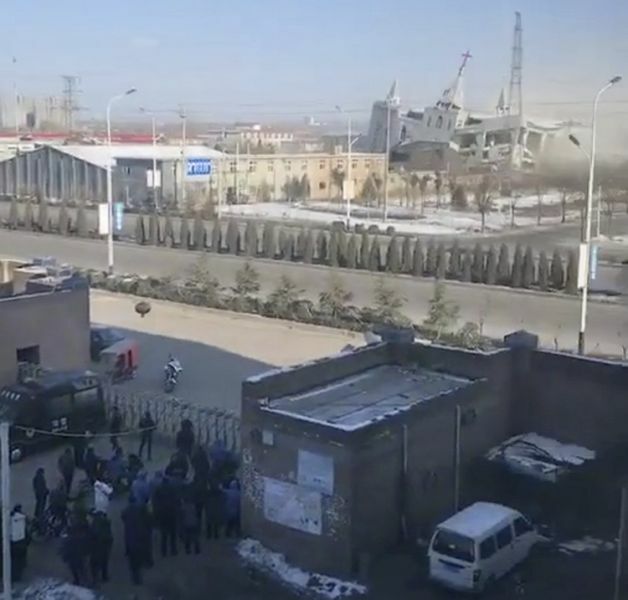 Police cordoned off the area around the Golden Lampstand Church church in Linfen, Shanxi province, on Sunday before construction workers detonated explosives inside, according to witnesses and the head pastor. After the initial explosion, crews broke apart the remaining pieces with diggers and jackhammers. 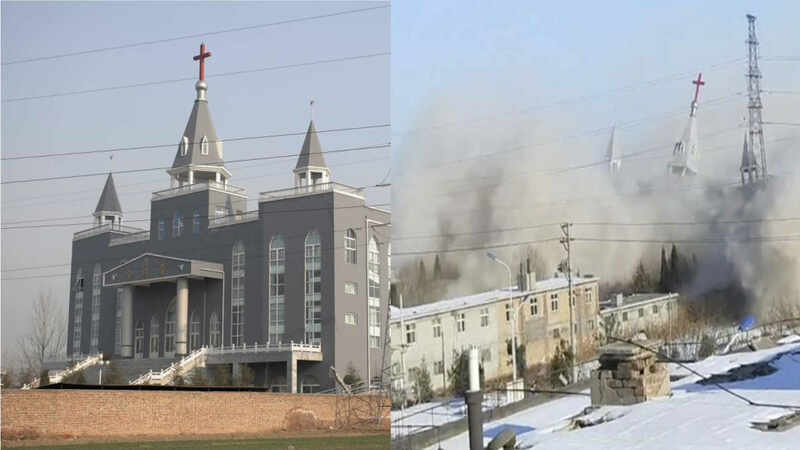 A Catholic church in the neighbouring province of Shaanxi was also reportedly demolished last month, 20 years after it originally opened. China guarantees freedom of religion on paper, but in practice authorities heavily regulate many aspects of religious life. Churches must be officially sanctioned and pastors must adhere to a host of rules imposed by the government. The restrictive policies have given rise to “house” churches, independent places of worship that exist outside official channels. Authorities periodically arrest pastors or demolish buildings used by unsanctioned congregations. But authorities have taken a harder line since 2013 against towering crosses and large cathedrals. Officials launched a sweeping crackdown on churches in Zhejiang province that accelerated in 2015, and more than 1,200 crosses have been removed, according to activists. Christian persecution in China is nothing new, but in recent years a drastic turn of events has occurred signaling that the Communist nation may soon make being a Christian illegal. Incredibly in November 2017, China’s Communist Party ordered that Christians replace religious imagery in their homes with imagery of the countries leader, Xi Jinping. “Party members should not have religious beliefs, which is a red line for all members. … Party members should be firm Marxist atheists, obey Party rules and stick to the Party’s faith … they are not allowed to seek value and belief in religion,” Wang Zuoan, director of the State Administration for Religious Affairs, wrote in an article for the CPC Central Committee, as reported by China’s Global Times on Tuesday. – Learn More. China has a bloody history of religious persecution, especially against Christianity, however, in modern times many of the World Leaders and News Organizations are failing to recognize China’s actions as violations of Human Rights. A similar lack of coverage was given to the Christians in the Middle East whom were driven out by Muslims because of persecution. Dating back to around October 2016, China initiated a Religious Winter in bid to destroy Christianity, and such is evident in the Communist Parties recent actions. In 2016 rules were authorized which were designed to further deter the rise of Christianity in the region. China is increasingly becoming a nation where Christians are hunted, all the while, the majority of the world stays absolutely silent. GERRY SHIH. 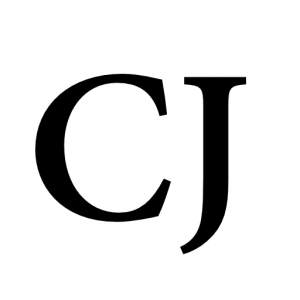 “Chinese authorities demolish well-known evangelical church.” Associated Press. . (2018): . .
Billy Hallowell. “Chinese Authorities Reportedly Detonate Bombs to Destroy ‘Serially Persecuted’ Christian Church.” Faith Wire. . (2018): . .
Benjamin Haas. “China church demolition sparks fears of campaign against Christians.” The Guardian. . (2018): . .
Paul Eckert. 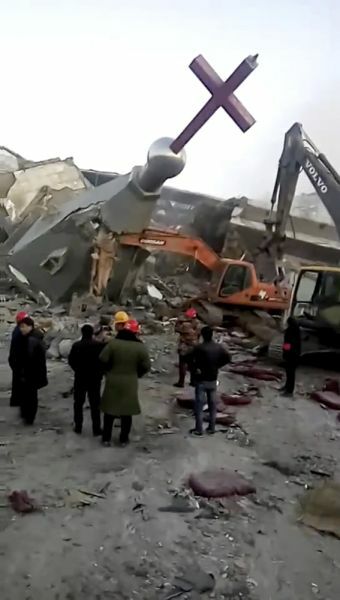 “Shanxi Christian Church Demolished, Congregants Pressed to Stay Silent.” Radio Free Asia. . (2018): . . Reported by RFA’s Cantonese Service. Written in English by Paul Eckert. Excellent if only more countries would take a stand like China and rid this world of religion. This is OUTRAGEOUS!!!!!!!!!! And we hear NOTHING about it in the news !!!!!!!!!!!! God bless these persecuted brothers and sisters for the bravery they hold.